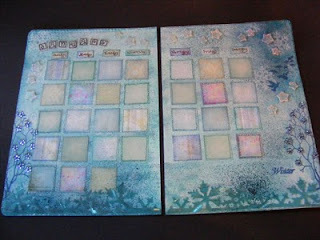 I was excited to be able to choose Kate Crane's art journal project from the January issue of Craft Stamper. I always knew it was an ambitious choice as we have all been really busy one way and another. What I didn't know was what was just around the corner for me during January, when my OH ended up being admitted to hospital as an emergency. I had started these pages in good time and had planned to get them done in time so I could write up each day through January - but it wasn't to be. I started my pages with a layer of gesso and then some turquoisy green EcoGreen paint which I love. I added some Stream Adirondack ink through sequin waste around rhe edges of the pages. Then I sprayed first with Marshmallow Glimmer Mist and Adirondack Stream Color Wash spray. 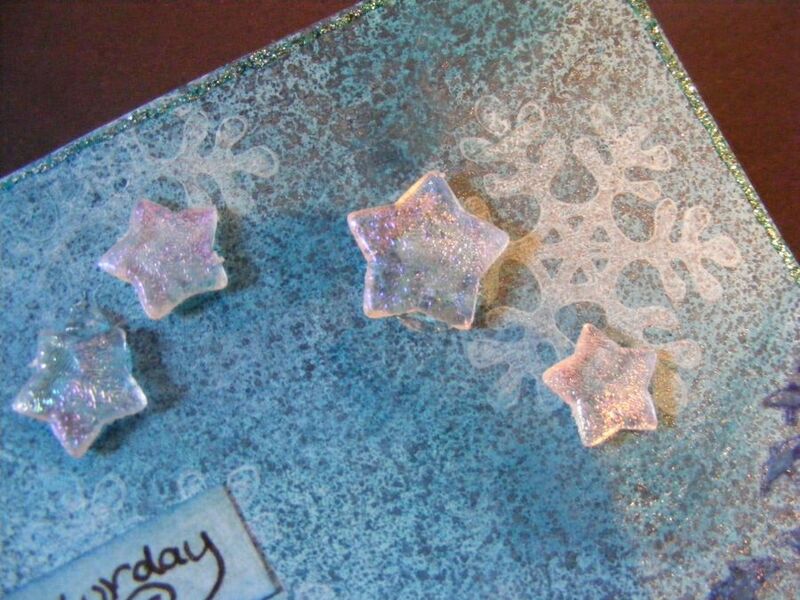 I added a snowflake stamp all over the pages stamped in white Versamagic. I cut squares of blending papers, inked the edges a little and added hand-drawn details to each square. 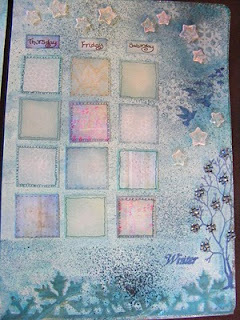 I stamped January from a Paper Artsy alphabet stamp set which I love. I hand wrote the days of the week - scary because I don't find it easy to use a more relaxed style. I used one of the Elusive Images trees from the brilliant Arboretum set and covered these in blue jewel flowers. I added little irridescent stars all around the pages and some blue stickles around the edge of the pages. I just had to add some of my favourite bling! 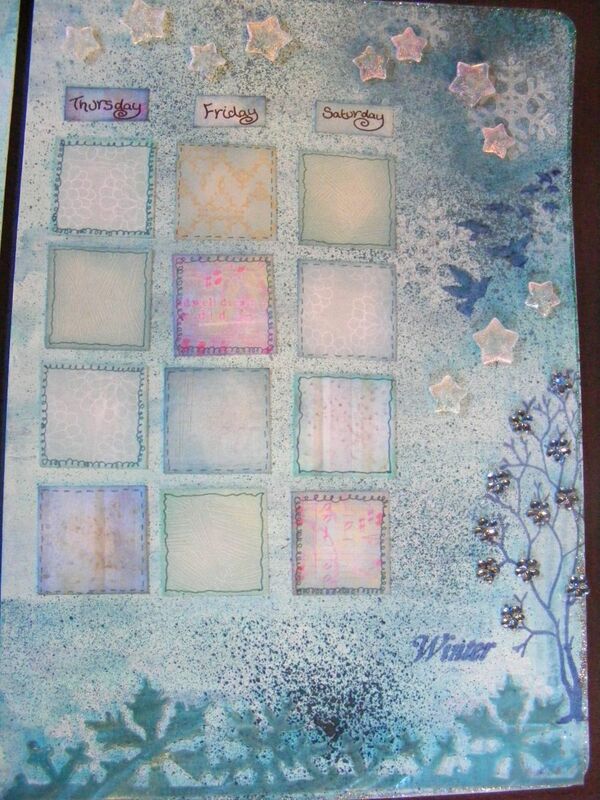 I added a Tim Holtz bird stamp and the word Winter. These two additions didn't work that well, but I was learning to let go of my need for perfection and have made myself leave them untouched. Last, but not least I added an edging cut with the Tim Holtz snowflake flurries on the edge die, cut from some turquoise funky film. I decided I didn't want to journal the January I had, so I have decided to make my monthly pages through this year, ready to use the journal in 2012. To do that I had to remind myself to get the layout of the days right for next year. My February pages are in the pipeline! Currently it is very pink!!! Finally, I hope you will forgive a little personal reflection. I know we have been quiet on this blog lately, what won't show to the outside world is the frequency of the contact the four of us who form this quartet have with each other. We are all in touch with each other at least once a day and often more. I still count my blessings every day, that crafting and particularly the Graphicus Guild helped me find three of the best friends any one could wish for. While I was struggling to get my head around the crisis that had hit me in January, Jo, Judith and Lesley were with me every step of the way. Thanks to texts and e mails despite the distance between us, they surrounded me with love and support when I needed it most and really helped me get through. My experience has reinforced for me what amazingly generous people crafters are. I could not let this opportunity pass to send them my heartfelt thanks to the other girls for being the most special friends I could have been blessed with. What serene pages for such a turbulent month, Elaine. I particularly love your trees which seem to sparkle with real optimism and magic. What a triumph that you created this beautiful project at such a difficult time. Well done for using your own handwriting. It works well and I hope you'll feel encouraged to use it more. Your words about our friendship made me well up. Our bond certainly transcends the many geographical miles between us but in January we all cursed those miles, unable to come to your aid in a more practical way. Good to see that you have crafted your way through your trials. It is such marvellous therapy. 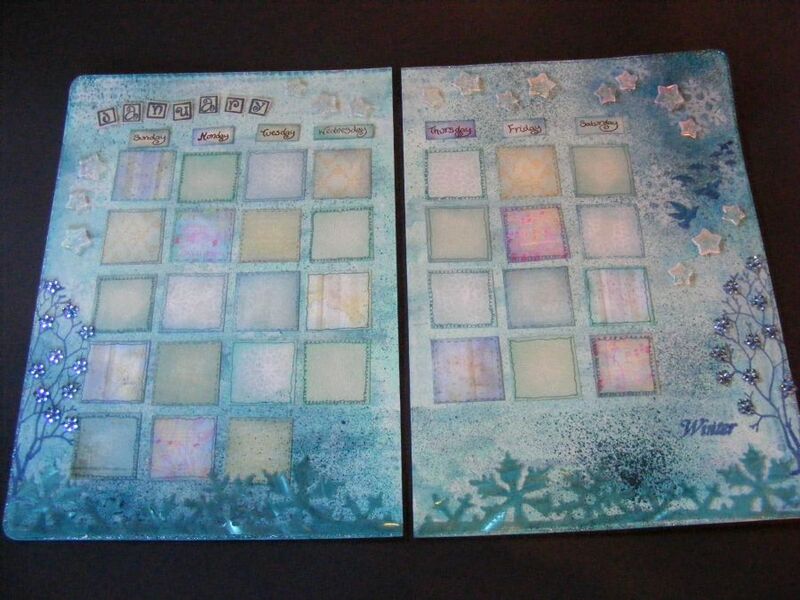 These are beautiful pages Elaine, and I can understand you not wanting to fill these, with the January that you had this year. I love the colours that you have chosen, Winter is not my favourite time of year, but you have made it feel more appealing with the sparkly trees, and Tim Holtz snowflakes. The little details all add up to make lovely finished pages. Your words about our friendship are so true, and very touching. I'm sure that if we lived near each other we couldn't be better friends. We have all been very lucky to find each other, and I am constantly thankful. What a triumph your beautiful pages are Elaine. The colours are so delicate and very reminiscent of a bright frosty morning (which I love). The detail you have managed to incorporate without any suggestion of cluttering is amazing and I love the little flight of birds myself. It was one of the first details I noticed. The sparkly trees are gorgeous and for someone who finds it so difficult to take a relaxed attitude to crafting you have done so here to 'perfection', lol! The hand drawn edgings to your day squares are a special little touch too. These pages are not only a crafting triumph, they are also a triumph over the trials and tribulations January 2011 threw at you and I think your decision to save them until January 2012 is the right one. I look forward to seeing the pages you create throughout the year. Lastly, like Jo and Judith, your final paragraph really hit a soft spot! As Judith said, I'm sure we couldn't be better friends if we lived five minutes from each other and the distance we have to travel and planning we have to do to be able to spend time together makes sure that we never take those times for granted and they are always special. However, during your recent crisis the level of frustration at not being able to offer practical help or even a real shoulder instead of a virtual one was high but as long as knowing we were 'there' helped that's all that matters. I look forward to reading what you write in your little boxes next January and I'm sure they'll be happy comments! This is a beautiful start to a diary/journal and I do hope you have something really good to write into it next January. It is really interesting to follow your long distance friendship and collaboration and look forward to seeing more of your pages as the work progresses. Take care. I love this Elaine! Its so ethereal and fit for a snow queen to write her diary in.